If you are on my newsletter list (and if you aren’t just click HERE to add yourself), you will know that I keep featuring and talking about the Buffalo Check stamp set. It is seriously one of the best stamp sets in the Stampin’ Up! Holiday Catalogue!! It looks great on Christmas cards, like this one here, but I also look forward to using it on other cards too. If you like it, don’t wait to order it as we won’t know if it will be available after the Holiday Catalogue ends on January 2nd. See all the supplies used on this card below. Also on this card, is the Snowfall Thinlits, from the limited time, Snowflake Showcase promotion. These are wonderful dies that have a variety of snowflakes sizes and also flowers. This card was made, by a very creative demonstrator in my group, Laurie Alexander, from Burlington, Ontario. I love how Laurie used several sizes of the snowflake diecuts to make a gorgeous multi-layered snowflake. You can see more on how what’s included in the Snowflake showcase and how to get those dies HERE. You can also click on any of the product pictures below to go directly to on Online Store. The overall look of this card is a rustic winter and that is in part to the wooden elements combined with the Buffalo Check and the Burlap ribbon. The “Merry” on this card is part of the Farmhouse elements. And it was coloured by dabbing Cherry Cobbler ink, from sponge daubers onto the wood. Love that effect! The bad news is that these elements are already sold out (see more about product updates here). However, if you like this look there are some other wood elements called Frames Elements in the main Stampin’ Up! Annual Catalogue (and they include hearts and frames and some leaf elements that are perfect for Valentines Day). Plus there are more coming in the Stampin’ Up! Sale-a-bration Catalogue in January (make sure you are on my list to get those catalogues). 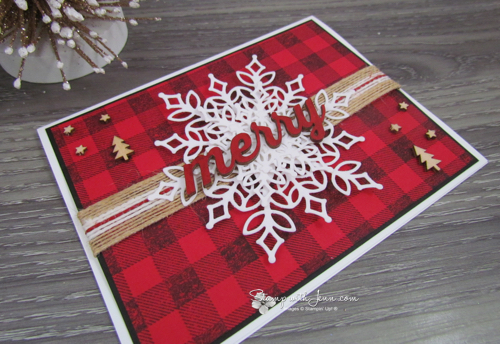 Be sure to check back to www.StampwithJenn.com tomorrow and I’ll feature another card featuring the Snowfall Thinlits.